I, for one, genuinely wish that the climate crisis were an illusion. But unfortunately, the reality of the danger we are courting has not been changed by the discovery of at least two mistakes in the thousands of pages of careful scientific work over the last 22 years by the Intergovernmental Panel on Climate Change. In fact, the crisis is still growing because we are continuing to dump 90 million tons of global-warming pollution every 24 hours into the atmosphere — as if it were an open sewer. But the scientific enterprise will never be completely free of mistakes. What is important is that the overwhelming consensus on global warming remains unchanged. It is also worth noting that the panel’s scientists — acting in good faith on the best information then available to them — probably underestimated the range of sea-level rise in this century, the speed with which the Arctic ice cap is disappearing and the speed with which some of the large glacial flows in Antarctica and Greenland are melting and racing to the sea. The heavy snowfalls this month have been used as fodder for ridicule by those who argue that global warming is a myth, yet scientists have long pointed out that warmer global temperatures have been increasing the rate of evaporation from the oceans, putting significantly more moisture into the atmosphere — thus causing heavier downfalls of both rain and snow in particular regions, including the Northeastern United States. Just as it’s important not to miss the forest for the trees, neither should we miss the climate for the snowstorm. Here is what scientists have found is happening to our climate: man-made global-warming pollution traps heat from the sun and increases atmospheric temperatures. These pollutants — especially carbon dioxide — have been increasing rapidly with the growth in the burning of coal, oil, natural gas and forests, and temperatures have increased over the same period. Almost all of the ice-covered regions of the Earth are melting — and seas are rising. Hurricanes are predicted to grow stronger and more destructive, though their number is expected to decrease. Droughts are getting longer and deeper in many mid-continent regions, even as the severity of flooding increases. The seasonal predictability of rainfall and temperatures is being disrupted, posing serious threats to agriculture. The rate of species extinction is accelerating to dangerous levels. I have already had several posts on the bogus claims of “Climate-gate” which showed that some scientists might have violated the British Freedom of Information law but there was nothing uncovered in the stolen emails to cast true doubt upon the scientific findings. It is also worth pointing out once again that the scientific method is self-correcting when we use this, as opposed to political or religious biases, to try to explain the world. The point of predictions with regards to climate change is that human action is causing serious problems and not to make exact predictions regarding what will occur on any given date. Such specific predictions will change as we get more data. The fact is that in many cases the effects of climate change have been following the worst case scenarios so far. While we cannot be certain as to exactly what will melt in which year, the underlying predictions of global warming are unfortunately being proven to be correct. John McCain was on Meet the Press again today. When did they pass the Constitutional amendment saying that the person with the most electoral votes becomes president, and the person who comes in second becomes a regular guest on Meet the Press? Is he being prepared to become the next host of the show? On This Week Nancy Pelosi sounded confident of obtaining enough votes in the House to pass health care reform in the House. The House has already passed one health care reform bill but now must pass one to match the one passed in the Senate. Lost continues to suggest that the characters are on the island for a reason and that this had been planned well before the crash. Hurley and Jack are sent by Jacob to a lighthouse which has mirrors which could view people off the island. The big question raised but not answered is who Jacob was expecting to come to the island. The other character of significance on the island this week was Claire, who was quite scary–even before we learned that her “friend” is the man in black. She has been terrorizing the latest band of others, believing they have Aaron. This provided a reminder of events off the island in this timeline which we are no longer seeing. In the other timeline Jack now has a teenage son and we see a relationship analogous to the relationship between Jack and his own father. There was another suggestion that this is not simply a timeline which shows what would have happened if Jack and the others had never crashed on the island. Previously we saw that Jack had his appendix removed on the island. In this other reality Jack notices his appendectomy scar and is told by his mother that he had the operation as a child. He seems to recall this, but has doubts. There is no way that changing the timeline to prevent the crash would have also made Jack have an appendectomy at a younger age. Instead it appears that details in the other reality are somehow being filled in to explain changes which happened on the island, such as Jack’s appendectomy. What Is the Island? That very huge question will be answered in less time than you think–somewhere around halfway through the season, according to sources. Awesome, right? And you know who’s going to help deliver the message? The fantastic, ever-youthful guyliner model Mr. Richard Alpert (Nestor Carbonell) and his longtime friend Jacob (Mark Pellegrino). It’s gonna be good. So…What Is the Island? It’s described as a four-letter word. There’s your first clue! Shall we play Hangman? There are no A’s or E’s in the word…Wanna buy another vowel? OK, but you only get one. Another thing I can tell you: The Island has to exist, according to my sources, and more important, someone has to protect it. It’s important to the world outside. Kristin has more information on Lost here. Caprica is growing on me further after this week’s episode. We know how it will end with the Cylons rebelling, and we got a strong indication of why when Daniel Graystone was describing how the Cylons would be created as essentially a slave race. This was the first episode to really do very much with Tamara who rapidly developed from a lost girl in the virtual reality to a very powerful character playing a game in New Cap City. This raises questions of whether there is a connection between her and the ultimate development of the Cylons. It is easier to see Cylons developing into a slave race capable of destroying their masters if Tamara as opposed to Zoe winds up providing much of their intellect. Big Bang Theory returns Monday with Sheldon in jail and Stan Lee as guest star. The following week Sheldon (pictured above looking a little different) becomes obsessed with a ring found a a garage sale. They began work on the episode featuring the return of Wil Wheaton last week. In the episode to air on April 12 “Sheldon will have an opportunity to settle the score with Wil when the our genius gang competes against the gang from the comic book store during a bowling face off. Turns out that Sheldon bowled as a child and was on a championship team in the East Texas Youth Camp in the 7- to 13-year-old division.” So this explains why Big Bang Theory executive producer Bill Prady was asking questions about bowling on Twitter last week. Meanwhile Wil Wheaton is both blogging and tweeting about the episode. This has included pictures such as the one above which shows the detail in the sets, such as with Sheldon and Leonard’s coffee table. The magazine seen is Mental Floss. There was a lot of fun stuff at their site and I wound up sending in a subscription order. Naturally when the order page had a spot for saying where I heard about the magazine I answered, “Sheldon and Leonard’s coffee table.” From the site it is clear they will understand. 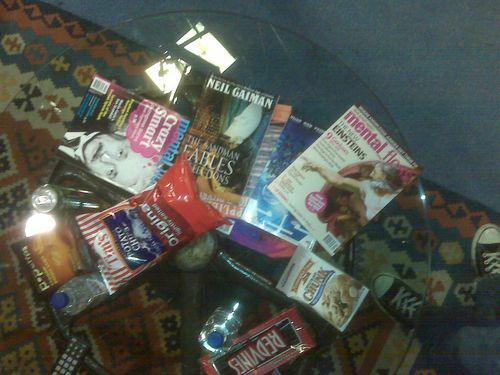 A different type of magazine has also discussed Big Bang Theory. UCLA Today has an article on the science adviser for the show. I’ve previously reported that the upcoming season of Doctor Who will begin airing on April 3 on the BBC. In the past there has been a delay of several months before the show would air in the United States, with large percentages of fans finding ways to get copies of the episodes rather than waiting. 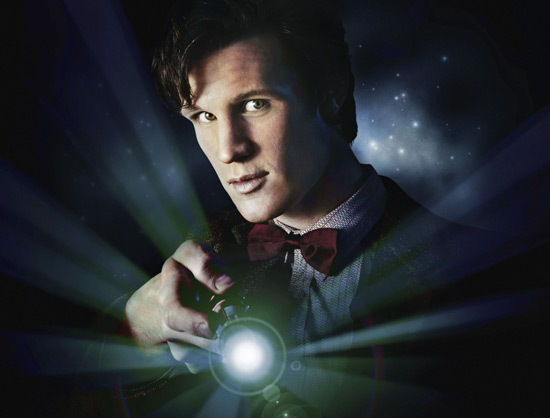 BBC America has now announced they will begin the series two weeks later on April 17. This is an improvement but I feel that in this day and age they are still making a mistake. Many fans of the show will not wait even two weeks to see new episodes and anything which can be digitalized can easily be transferred over the ocean. HowItShouldHaveEnded.com has posted the above video of how they think the Star Trek movie should have ended.